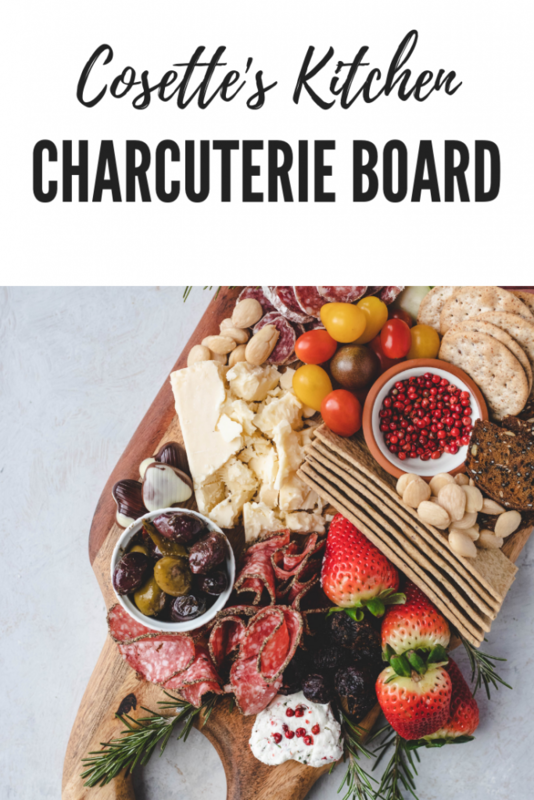 The ultimate party showstopper, the Charcuterie Board! I have hosted many parties in my 39 years of life. In the past few years, my dinner party skills have definitely improved. 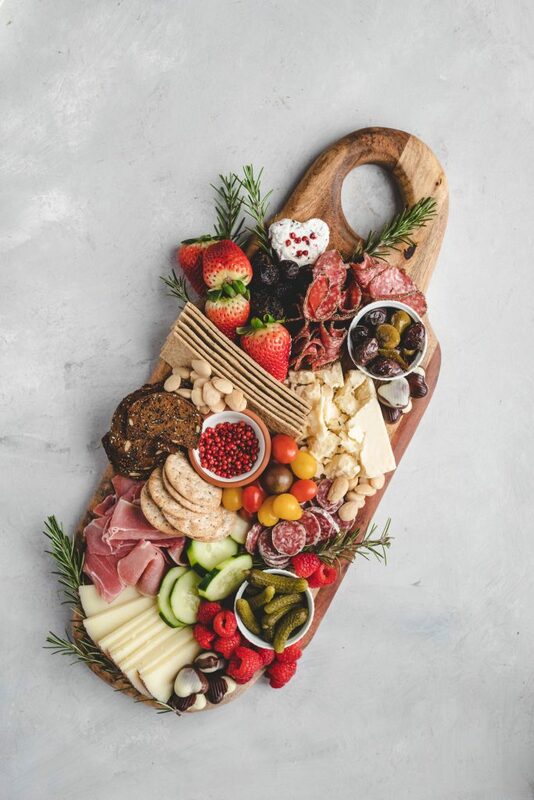 But all in all, you put out some type of cheeseboard and your dinner guests will be beyond thrilled. But the question I always seem to get is, how do you make your board look like that? So I thought I’d put together a small tutorial for you to make the ultimate cheese board. 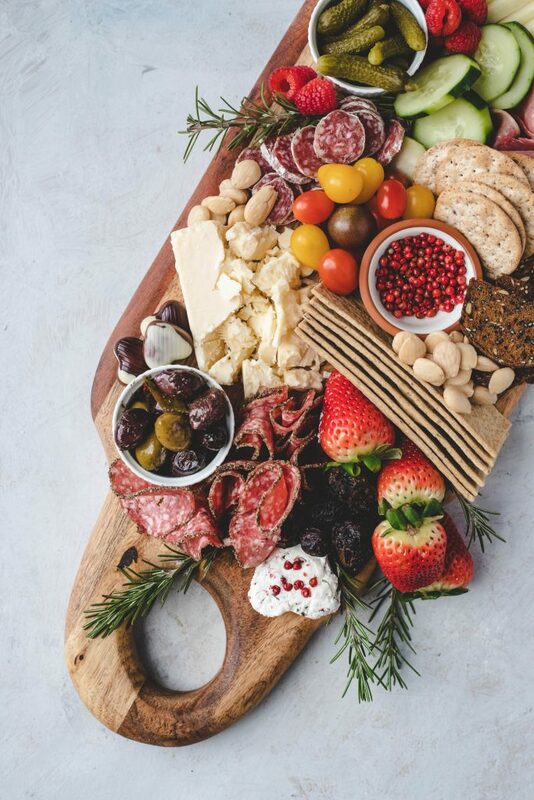 This board is geared for a small snacking platter or a meal for two, you can always add more to a larger board to be fit for a party. Choosing your board for the mood of your event. Add in ramekins for your pickles and olives. 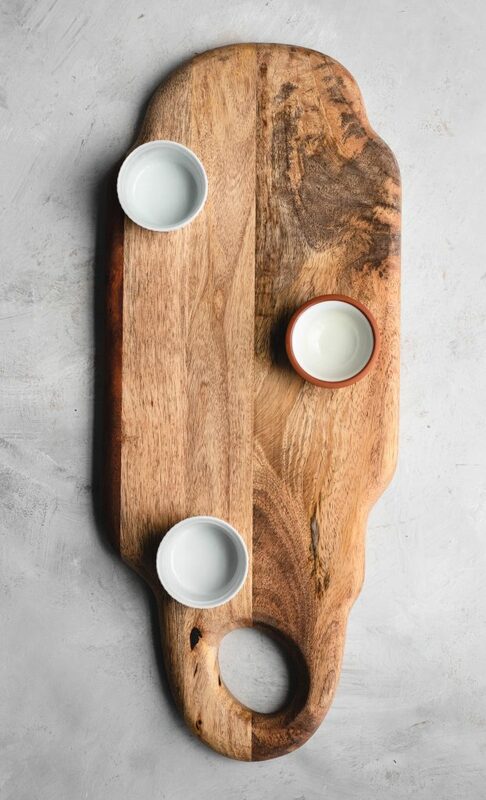 If you’re looking for a showstopping piece, something that will last a lifetime and really wow your guests, check out a local company Roe & Bella, they make stunning boards from salvaged wood. For this smaller sized board, I used one that is about 17″ x 9″ of surface area. All the components of your board. Start by setting up your cheeses. 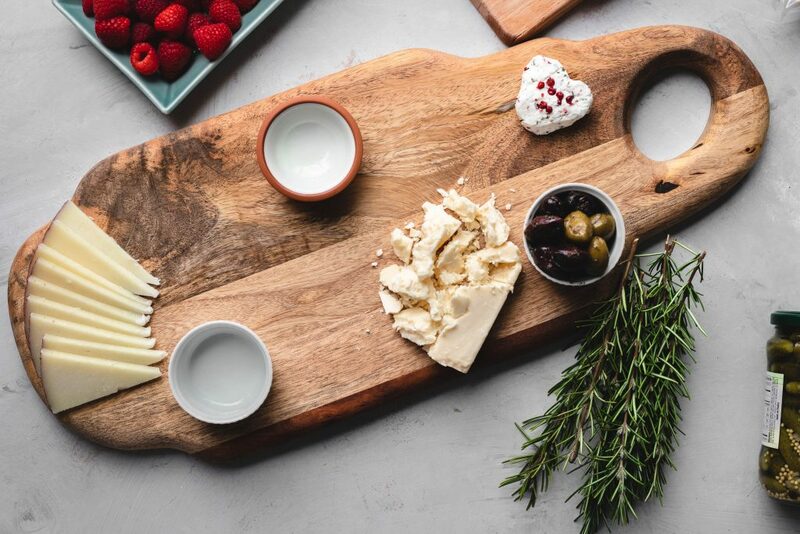 It’s always great to have a soft cheese spread like the Chèvre, I chose a plain one and added rosemary and pink peppercorns. I popped it into a heart-shaped silicone mold to create that cute accent on the board, perfect for Valentine’s Day. I’ve also added a small bowl of pink peppercorns to the board, they are oddly kind of sweet and soft. They can be eaten as it and a nice little addition to make everything pop on the board. The Manchego is such a classic cheese, it is made of sheep’s milk, super buttery and perfect for slicing. And finally, the Unexpected Cheddar, this cheese is exclusively sold at Trader Joe’s and almost has a cult following. It’s an aged cheddar but has a completely different texture and notes of a Parmesan cheese. It crumbles well which is a nice variation on the board. Another cheese alternative could be a Stilton or a Blue cheese. 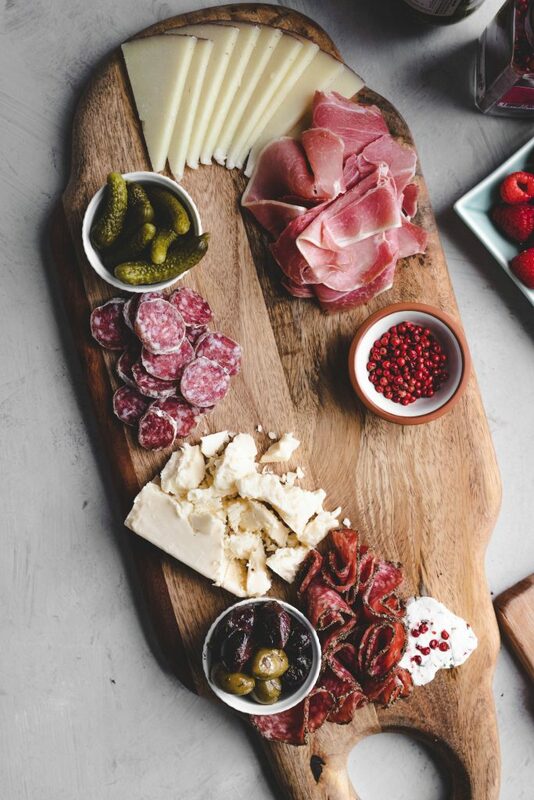 Traditionally, cured meats are common for a charcuterie board. I try to use a variety of salamis including: prosciutto, peppered salami and salami secchi (hard salami). If you have folks that don’t eat pork products, you can always substitute with smoked salmon or chicken/turkey products. At this time I begin nestling salami next to the cheeses and across the board. 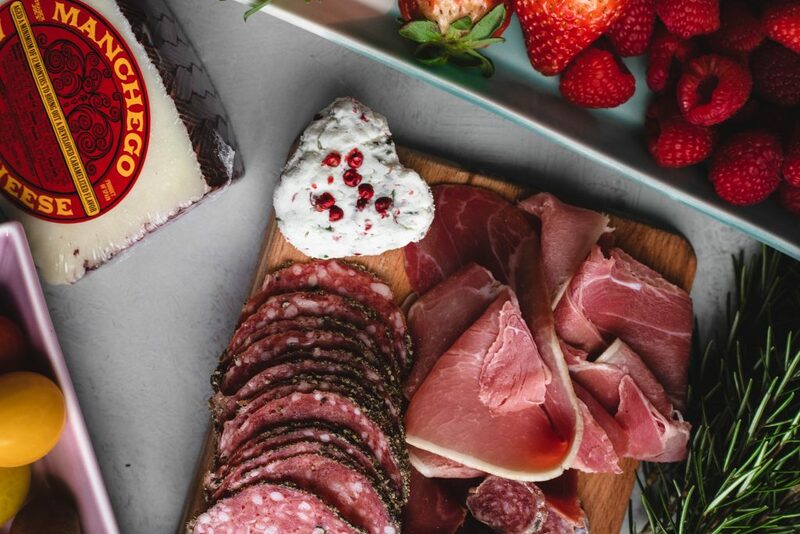 The thin salami can be folded and tucked in like little flowers or fanned out, prosciutto nestled in little piles or rolled in cigar like sticks. Find your space and add your meats. Finally, fill in all the spaces with your additional items. 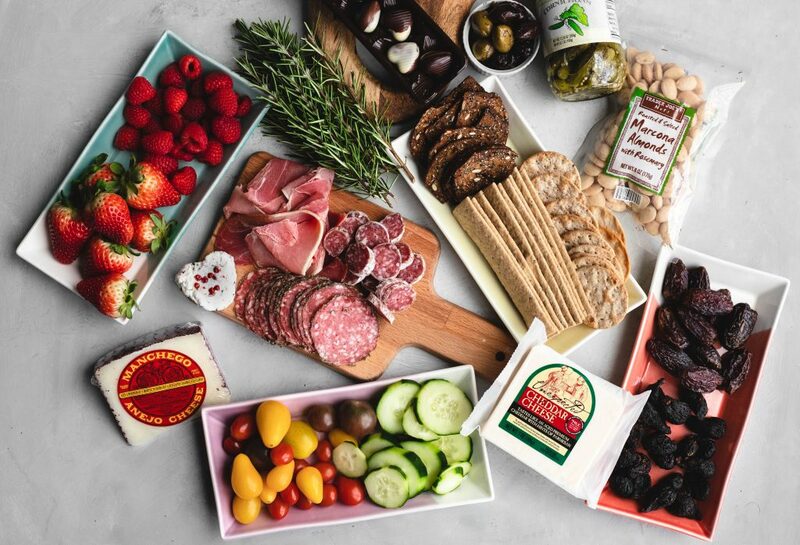 After your anchor meats, cheeses and ramekins are placed, the rest is about filling in the nooks and crannies. I start with some dried fruit, then crackers, then fruit and veggies, chocolate then finally nuts and herbs tucked around the edges to make it really pop. You can decide how much of everything you want to add in depending on your taste and what you’re in the mood for. The biggest thing is making sure you fill in every little area. The beauty comes from the abundance. What I love to do if I’m short on time is prep everything for my board the night before. Slice the cheese, the meats, the veggies. Pull out the accoutrements and begin assembling the board. Snap a picture then put everything away in containers. The day of your event, pull up your picture and begin assembling with all your pieces. Such a time saver and gives you time to visualize what you want without feeling rushed. If you’re looking for an alternative for your gluten free, vegan guests, consider a Mediterranean Mezze platter. Add dips such as hummus and baba ganoush with veggies for an alternative fit for all your guests. I hope this little tutorial gives you the confidence to create your own perfect board. I would LOVE to see your creations, tag me on Instagram or Facebook if you try to make your own special board.